Microsoft confirmed in January that ReCore is releasing on PC as well as on Xbox One. 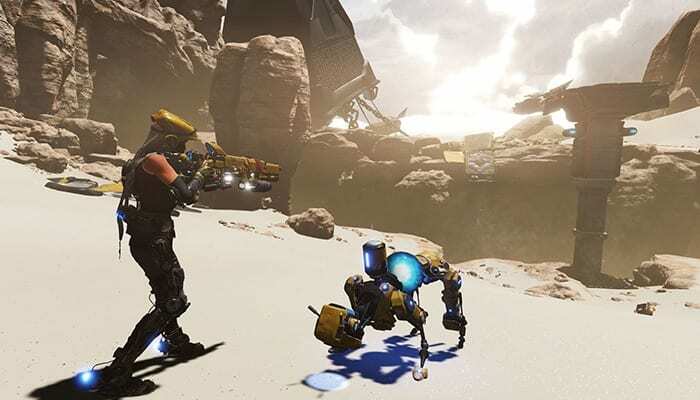 Like Forza Horizon 3 and Halo 5: Forge, you will require a Windows 10 PC to play ReCore. The system requirements are quite demanding and I think, every upcoming game of the year will have demanding system requirements as well. According to PC Gamer‘s Andy Chalk, “Windows 10” is replacing the more wide-open “PC” as a system requirement. Strongly agreeing to his words, I must say most upcoming Xbox exclusive games will come to “Windows 10”. PC falls a bit old for Microsoft-published games now. The game supports Xbox Live feature that enables cross saves between your Xbox One and PC systems. Get the game on Xbox One, and play it for free on your PC with the Xbox Play Anywhere service. Also, although ReCore support Mouse/Keyboard, Microsoft suggest using an Xbox One Controller for better experience. The ReCore page on Microsoft Store clearly mentions that game will release on September 13 and will be available for download 9:30AM onward. The size of the game is approximated between 6.45Gb and 6.5GB. The game promises robotic chaos, mystery and a dynamic world. Keep in touch with Spiel Times for more gaming, technology and esports related information, news and stuff. Yes. But my build falls way behind than the average gaming PC. So, probably need to upgrade my system. Not sure about you guys. These requirements are less crazy than Gears 4 requirements so I should be okay. I’ll manage on my i3 somehow. Huh, I wonder if they’re overestimating or if it’s real. Finally I wonder if they’re going to support crossfire and sli. I think they’re just assuming that the system requirements will come close to these. I’ll still play on my i3 btw.